Improve profitability with enterprise-wide control of real time inventory data. Famous comprehensive Inventory Management tools enable you to get the right product to the right customer with remarkable efficiency. Pinpoint the location of product. Revolutionize the way you ship. Accelerate loading and shipping functions. Manage complex truck scheduling, prioritize loads, manage multiple warehouses and view warehouses individually or as a group. 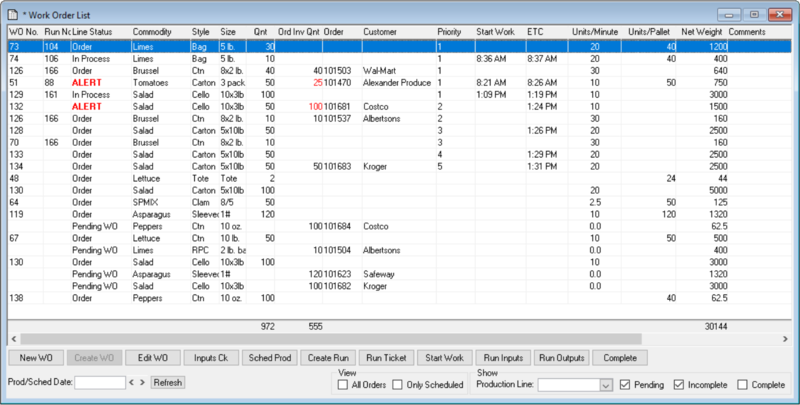 With Famous, changing schedules is quick and easy with drag and drop action and automatic revisions of shipping lists. Easily consolidate multiple partial orders onto a single pallet while maintaining the integrity of your traceability, inventory, and accounting data. Famous also enables you to combine product from multiple purchase orders or lots onto one pallet or truck load from multiple warehouses or storage rooms within your operation. Tracing product down to a pallet, and even to a single case, makes it possible to monitor the quality, condition, and source of the products under your control. Famous exceeds regulatory compliance data collection standards and maintains all food safety regulatory information for received product so you are always prepared with answers before any questions are asked. Famous also simplifies meeting regulatory compliance by giving you the ability to generate detailed traceability reports and complete food safety audits. Famous Warehouse Management System (WMS) allows you to conveniently manage and control your inventory from any warehouse location in real time.